On 21 April 1958, France issued the second set of stamps in a series titled Heroes of the Resistance. This set comprised four stamps. All stamps were designed by Albert Decaris, but he only engraved two. In this blog we shall study the first and lowest value stamp in the set. 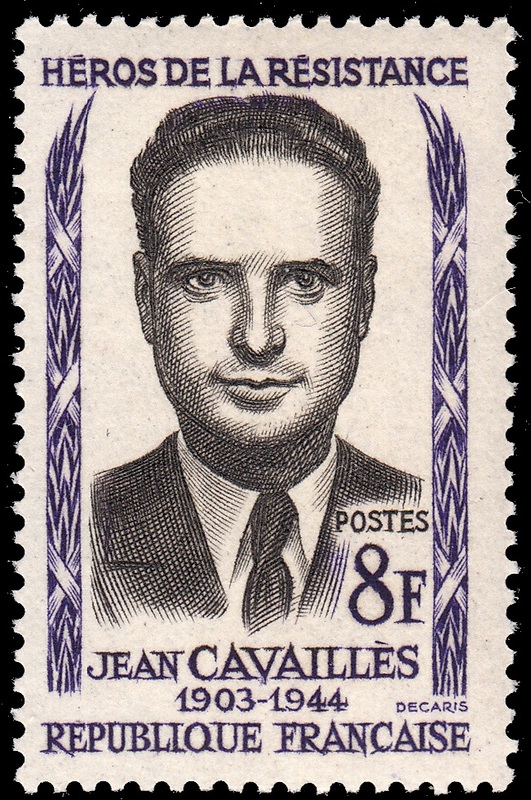 This stamp depicts Jean Cavaillès. It was designed and engraved by Albert Decaris. Jean Cavaillès was actually a rather interesting character. He was a French philosopher and mathematician, specializing in the philosophy of science. At the outbreak of World War II, he joined the French army and was placed as an infantry lieutenant with the 43rd Regiment. In this capacity he was twice honoured for bravery. Unfortunately, he was captured by the Nazis on 11 June 1940 and imprisoned in Belgium. But after a little over a month in prison he managed to escape. Over the next four years he devoted his life to the Resistance. In December 1940 he helped create a group of resistance fighters called The Last Column. This group began publishing a newspaper called Libération. Then in 1941 he travelled to Paris and helped establish the Libération-Nord resistance group. By 1942 he found himself at the head of an intelligence network known as Cohors. His prominent position in the Resistance placed him squarely in the cross-hairs of the Vichy Regime. Consequently, in February 1943 he fled to London, where he met with General Charles de Gaulle. After meeting with de Gaulle on several occasions, he returned to France in April. Now determined to assume a more hands-on role in the Resistance, was placed in charge of the sabotage of the stores of the Kriegsmarine in Brittany, and the German radio installations along the coast. Sadly, he was betrayed by one of his liaison officers and he was arrested on 28 August, 1943. He was imprisoned in Fresnes, where he was tortured, then moved to Compiègne. He was shot by a firing squad on 17 February, 1944. In 1969, The Centre Cavaillès de l'École Normale Supérieure was established in Paris, to honour both the bravery and academic work of Jean Cavaillès.